Sega has reported their financial results for the first quarter of the 2009 financial year, and while the video games segment of their business saw sales growth of 90.6%, the company is still reporting a $963 million loss. The problem? 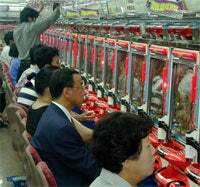 Those pesky Pachinko machines. With an operating income loss of $29 million and an overall sales drop of 21.8%, Pachinko is making the consumer side of Sega look bad. As stated, the consumer side of the coin is shiny, rising from $1.4 billion last year to $2.7 billion, with 87% of sales coming from North America and Europe. Sega's biggest sellers for the quarter were its line up of six Xbox 360 titles with 890,000 units sold, followed by the Nintendo DS with 850,000. If you ask me, it might be time to bail on the whole Pachinko business. Perhaps EA will pick it up?